In order to avoid this unpleasant situation, minimum effort is required. First thing you should do is select a disk array for storing backup copies. Since storing backups together with database files is not our choice, the second step will be to create a maintenance plan for the database backup. Next, we will discuss some subtleties associated with backups. 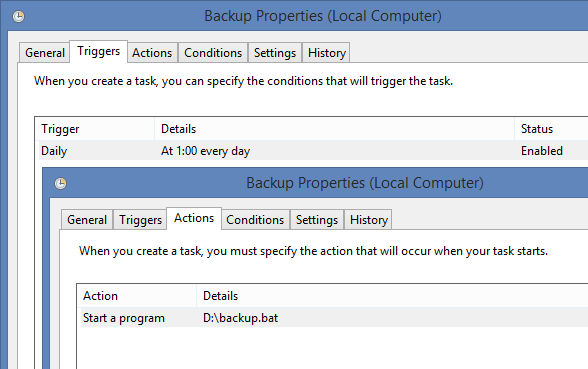 At this stage, the working script for automatic backup creation is ready for use. The only thing left to do is to create the job, which would run this script on schedule. Next, open the Task Scheduler and create a new task therein. The second option is to use a third-party software, which allows to run the tasks on schedule. Among them is SQL Scheduler – a convenient free tool. Now let’s talk about useful things associated with backups. The backup’s compression feature appeared: SQL Server 2008 (only Enterprise/Developer edition), 2008R2/2012/2014 (only Enterprise, Business Intelligence, Standard, Developer edition). There was a time when working with SQL Server 2005, I had to compress backups using 7Zip. Now everything is much easier. 3) the creation of compressed backups is faster and requires fewer I/O operations. A few drawbacks also exist – when working with compressed backups, the CPU load increases. You can see right away whether all the databases have FULL backups for the current date. Then you can look at the time of backup creation. You may ask why? Suppose that the backup of the DB_Dev database used to take 5 seconds, and then it began to last for 1 hour. The reasons for that can be various: disks do not handle the load, the data in the database grew up enormously, a disc failure in RAID and the writing speed has decreased. This can be useful when you copy a backup to a USB flash drive with the file system FAT32, which has the limitation on the maximum file size.